Prepare for stares of admiration! This necktie will elevate any wardrobe to the next level with a dash of attitude. Flip this tie over your shoulder or you'll dip the tip in your glass o' whiskey. Then all those behind you can marvel at your Outlander Tartan Necktie, made in Scotland from 100% pure new wool. Ladies: If you buy your man this tie, he'll get a lot of attention, so you'll need to keep him close to you. Fortunately, at 53 1/2-inches long x 3 3/4-inches wide, the Outlander Tartan Necktie conveniently doubles as a man-leash. 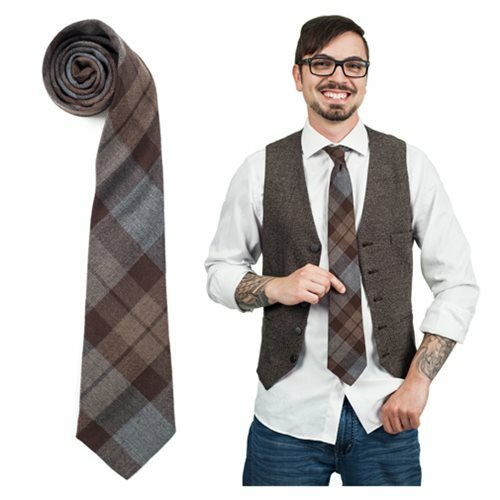 Guys: Nothing will make you look more dapper, but be warned: If your woman knows you own one of these ties, she may want to keep you on a short leash. So keep a loose knot!